Struggling to find drive axle and CV joint service in Grand Rapids? Your struggle is finally over. Jack’s Auto Service has been providing dependable auto repair service since the 1980s, and we are proud to have earned the reputation of being one of the leading auto repair facilities in Grand Rapids. Our auto mechanics are experienced, educated, & efficient, and we look forward to servicing your vehicle’s drive axle and CV joints. A vehicle’s driveline and chassis are comprised of components that transfer power from the transmission to the wheels. It is important for your vehicle’s drive axle and CV joints to be serviced and if needed, repaired on a routine basis. A recommended maintenance service schedule for your drive axle and CV joints will be listed in your owner’s manual. The ASE certified technicians at Jack’s Auto Service can develop a tailored maintenance schedule for you, based on the make and model of your vehicle. While driving, if you ever feel vibrations or hear clicking and clunking noises, we recommend bringing your vehicle to Jack’s Auto Service as soon as possible. 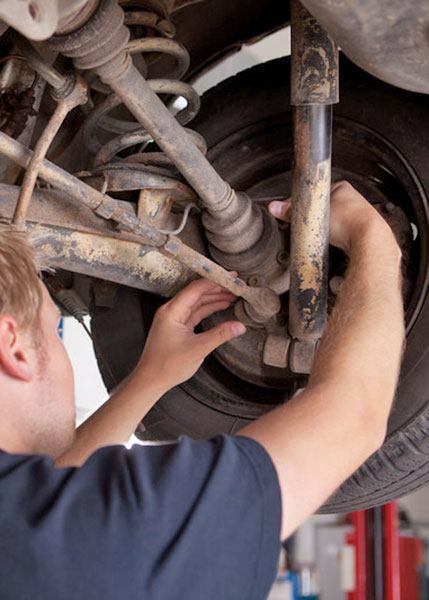 Let our auto repair experts inspect your vehicle’s driveline and chassis for signs of trouble. We will inspect each aspect of your car, and then review our detailed findings with you. We will do our best to go the extra mile for you and your vehicle. If your personal automobile or fleet is in need of drive axle and CV joint maintenance or repair, we invite you to Jack’s Auto Service. You can trust our friendly and experienced staff to get your car, truck, minivan or SUV driving its best!